Sea Otter Savvy Quiz : Savvy OR Not Savvy? You Decide! 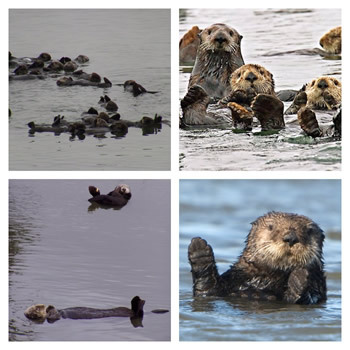 Sea otters are a popular subject for photography and video. In the age of the internet, images depicting sea otters in both wild and captive settings are easy to find, like, and share. At Sea Otter Savvy we encourage enjoyment of the many wonderful images of sea otters, but with a healthy dose of awareness and scrutiny. We love to see images of animals of all kinds looking at us---eye contact from the subject being standard for portraits that seem to engage the viewer in the moment. With sea otters, it is difficult to know whether that eye contact was a lucky moment caught with a telephoto lens, or the result of the sea otter noticing the photographer’s presence. While a gaze turned toward a photographer does not itself constitute a disturbance, it does shift the subject of the image away from natural behavior to a snapshot of a reaction to the presence of a human. More troubling than images depicting eye contact, are those showing the sea otter actively moving to avoid something in the direction of the camera---first raising their head and body high in the water (an alert behavior known as periscoping), then swimming or diving away. While we often can’t be certain the photographer caused the disturbance, we can turn a discerning eye to suspicious images. Evaluate photos of wildlife critically. Ask yourself, “Does this depict behavior caused by the presence and behavior of the photographer?” Do your part by not sharing, posting or liking photographs or videos that you suspect may depict disturbance by the photographer. This is not meant to include witness photos of disturbance events to be used for reporting or educating about disturbance (e.g. video of a third-party kayaker approaching too closely). Is the sea otter’s head, paws, and/or body raised high out of the water (periscoping)? Is the sea otter looking directly at the camera? Is there evidence of movement away from the camera (e.g. does the otter have a wake)? How Sea Otter Image Savvy are you? Take our quiz below!